We started last week with a Packer Secret Superstar from the other side of the ball (Blake Martinez) so let’s go to the Green Bay offense to kick things off in this edition with the second-year running back. 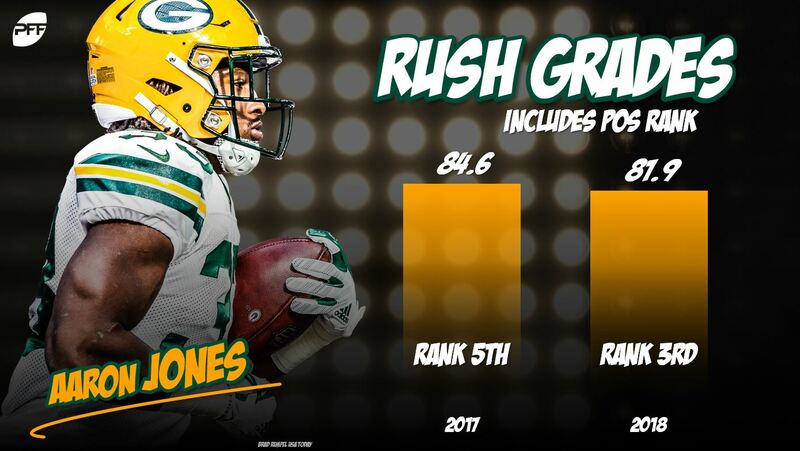 While he got significant playing time last year and was arguably the best of the Green Bay backs, Jones was limited by his work in the passing game. His 115 pass routes netted only 31 yards (on 13 targets) and his pass protection was 12th-lowest among backs with over 20 pass-blocking snaps. Luckily this was offset by some brilliant work carrying the football and his 84.6 rushing grade ranked him fifth overall. Fast forward to 2018 and despite a poor start with his two-game suspension, everything since then has come up smelling of roses. He’s still running at a high level with his 81.9 running grade ranking third among running backs but he’s already picked up 63% of the yardage of 2017 and had no negatives in protection. Now clearly the sample size is small, but if he can continue this progress, expect to hear his name mentioned among the best backs in football by seasons end. It was a bye week for the Redskins safety who has recreated himself after three lackluster years in Houston and then Tampa Bay. It seemed like a weekly occurrence that some coverage bust in the Texans secondary could be traced back to (or at least involved) Swearinger. His three-year grade between 2013 and 2015 for those two teams was a below replacement grade of 52.5 and the only real surprise was that he was given another shot by the Arizona Cardinals when the Buccaneers waived him in mid-November. 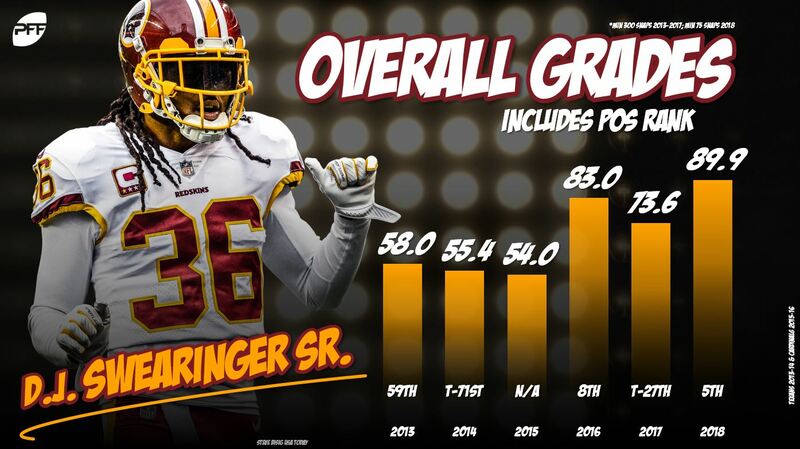 Doing just enough to earn a one-year contract, he made the most of it with an excellent season (83.0 overall grade) that lead to the Redskins signing him in free agency. Since then, he’s become a leading figure on the Washington defense and more than repaid the faith they had in him. His 80.5 grade since joining the Redskins ranks him 14th among all safeties over that time and his 89.9 grade sees him fifth so far this year. When the Bengals lost both Mohamed Sanu and Marvin Jones to free agency, the search was on to bring in players to complement the transcendent A.J. Green. 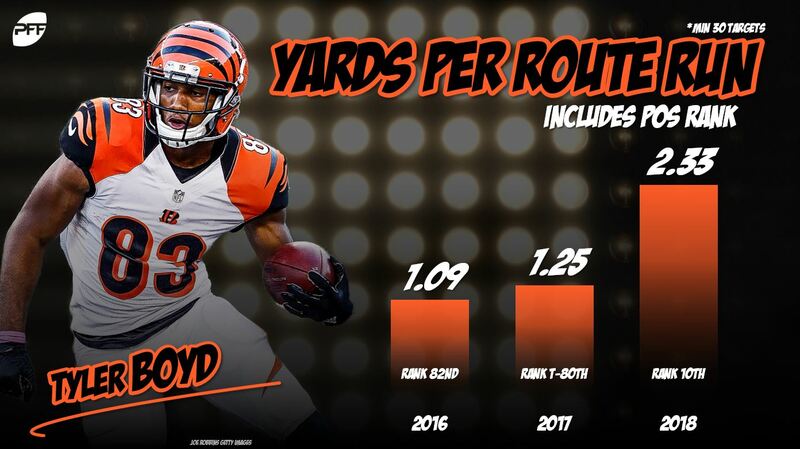 Many thought when the Bengals took Boyd out of Pittsburgh in 2016 they were sacrificing talent for production and as his first two years unfolded it seemed those detractors may have had a point. He looked anything but explosive and 1.16 yard per route run ranked 92nd overall during that two-season span. He wasn’t terrible, just as feared by some – average. A word you wouldn’t use to describe him in 2018 is average. He’s added a full yard per route to his numbers (his 2.33 is currently 10th among his peers), not dropped a pass and his passer rating when targeted of 130.9 is 10th. Sometimes production may be just as important as a fast 40-yard dash time. 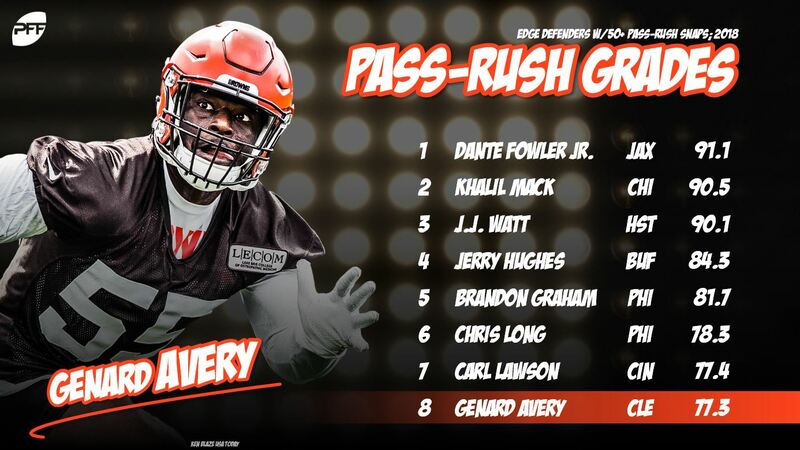 Although Avery hasn’t quite been able to replicate his brilliant Week 1 display against the Steelers (90.3 overall grade) in the last three games, he’s become an extremely important and somewhat overlooked part of what is turning out to be an excellent 2018 Browns draft class. Taken in the fifth round out of Memphis, his 91 QB pressures over his last two years in college ranked 12th among FBS edge defenders and his pass-rush win percentage of 19.6% saw him rank 18th in that category. On this basis alone, it’s perhaps a little surprising he lasted until the fifth round. PFF wasn’t really that different (we had him at 131 on our board) mostly because it was very difficult to determine what position he’d play at the next level, rotating in game for the Tigers between inside linebacker and edge defender. So far for Cleveland, it’s been far less diverse as he’s lined up as a standup left-sided edge defender on over 75% of snaps and it’s paying off with his 77.3 pass-rush grade eighth among edge defenders. Sometimes players creep up on you, slowly getting better over the games and then years to become superstars and sometimes players just explode out of nowhere. Some do regress as people start to get more tape on them while others build on that momentum. It’s too early to determine which one McGovern will be currently as he’s still only four games into that “exploding” process. After a poor rookie season (49.2 grade) there were minimal expectations outside Denver for McGovern, but he’s been at the hub of a rebuilt running game. Currently, far more emphasis for that is being placed on the two rookie running backs Royce Freeman and Philip Lindsay and while they’ve been very good, neither is currently ranked No. 1 overall at their position. 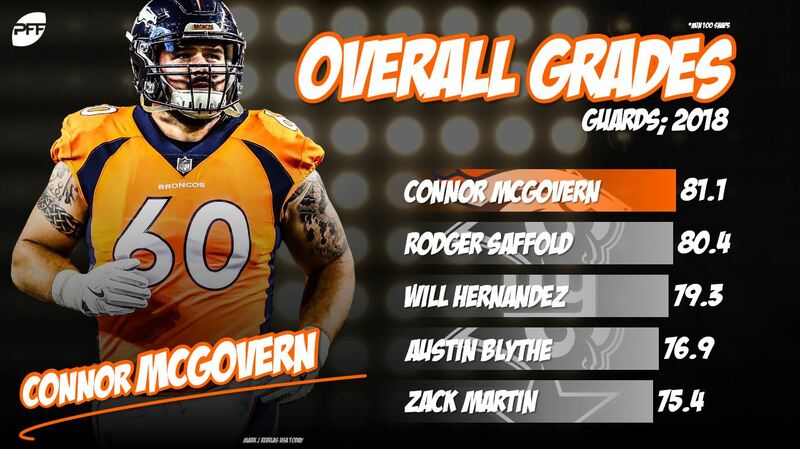 In fact, McGovern isn’t just our top-rated right guard, he’s our top-rated guard, period, built on solid pass protection and superb run-blocking in which facet of play he’s also our top-ranked player.